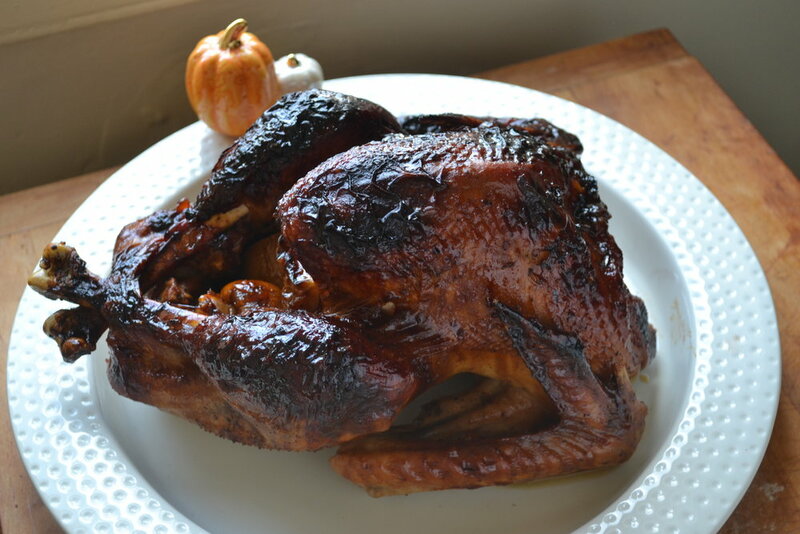 This recipe has been made at least once around Thanksgiving for three years running, I may never make another turkey again!. Please tell me how I can convince you to try it. I'll do it. I'd even drink the fat, Friends style. The sweet, almost-candy like skin provides incredibly satisfying crunch in contrast to the perfectly juicy turkey meat below. If you haven't decided on how to cook your turkey this year, this is what you've been waiting for. The best part is, it's no harder than your traditional butter basted turkey. I am very happy to finally be sharing this recipe. Preheat oven to 425 degrees Fahrenheit. Wash the turkey well, remove neck & giblets and dry thoroughly. Massage the whole turkey with butter and rub well with salt and pepper. Pull the legs together and tie with twine. Place the bird in a roasting pan with a rack. Pour in chicken stock. Place in oven and roast for 30 minutes. Meanwhile, melt butter, syrup and jam in a small saucepan. After 30 minutes reduce heat to 350 degrees Fahrenheit and baste turkey with the butter, syrup and jam mixture. Continue to baste every 20 minutes. If the turkey starts to brown in places, place some foil loosely over top of the turkey. Cook until the bird reaches 165 degrees Fahrenheit (seriously though). Total cooking time will be between 2.5 & 3 hours. Measure the temp by inserting the meat thermometer into the thickest part of the thigh, being careful not to hit bone. Allow the bird to rest for at least 30 minutes before carving. For the gravy, pour the drippings into a small saucepan. Skim off some of the fat and stir in the other cup of chicken stock. Reserve 1/4 cup of the mixture and stir in 2 tablespoons flour. Bring to a simmer and let it go for about 10 minutes, until the gravy starts to thicken. Then add in the 1/4 cup reserve. Continue to simmer for a few minutes more, then serve.